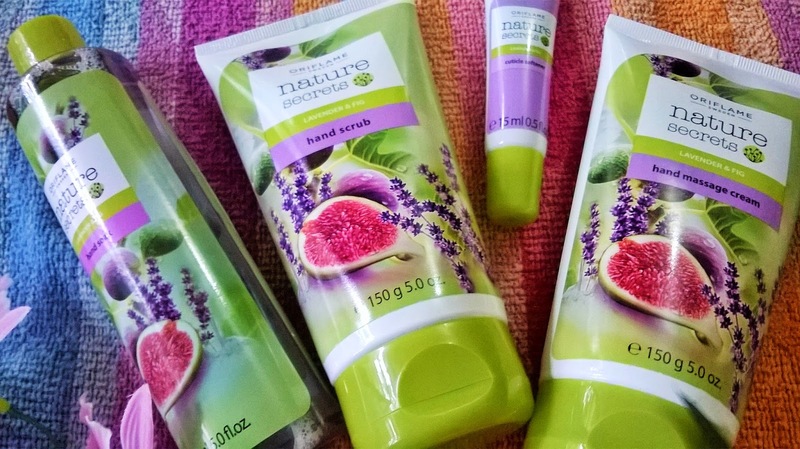 I always wanted to try home manicure treatments and so when I received the Oriflame Nature Secrets Lavender & Fig Relaxing Manicure Set I was so excited to try it out. 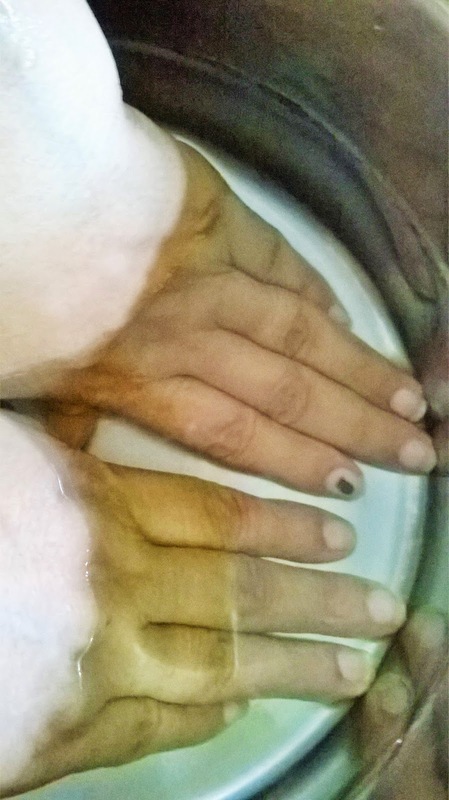 I was about to try it today, when I realized that more than me my mom needs a good hand-pampering session first. 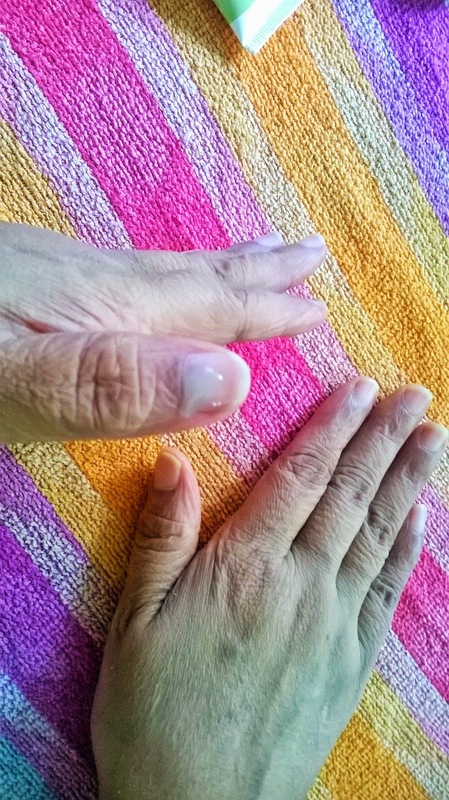 I tried the manicure set on my mom's hand and let's see what was her experience. 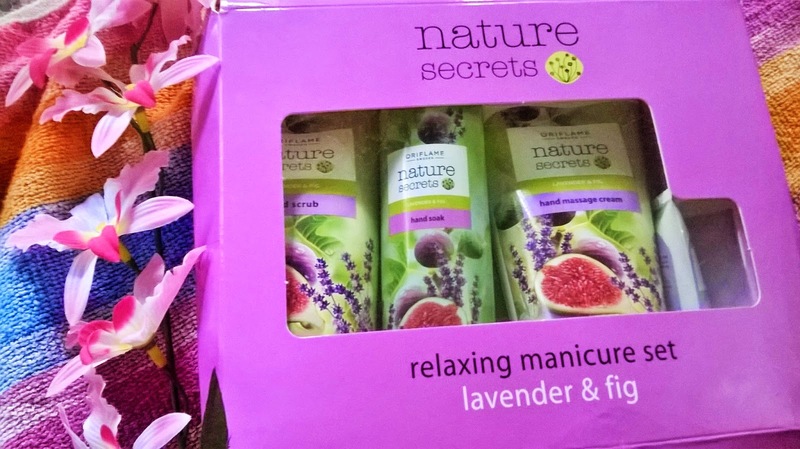 Oriflame Nature Secrets Lavender & Fig Relaxing Manicure Set is a luxurious kit formulated to protect and renew hands and nails. 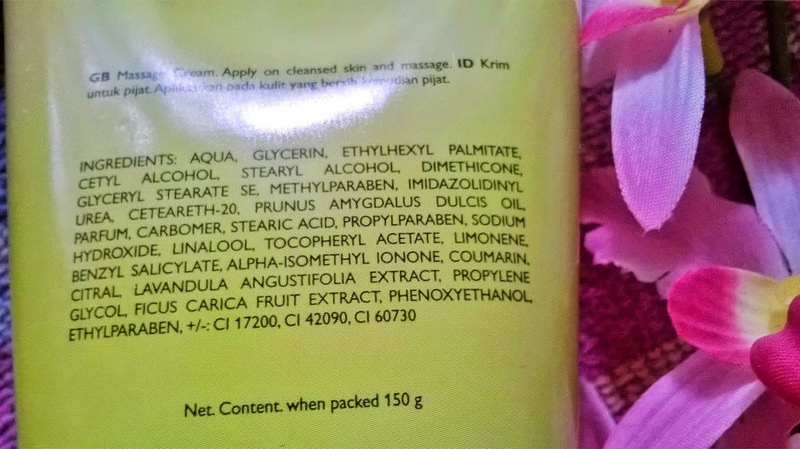 Packaging: The whole set comes in a beautiful Lavender colour cardboard packaging, with details of the application process and Ingredient lists mentioned at the back. 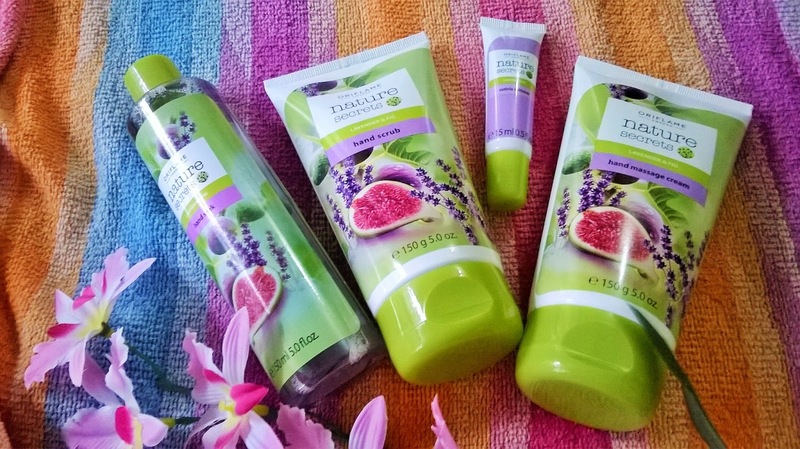 Inside the 4 products are equally designed with green & lavender and the images of lavender flowers & figs. 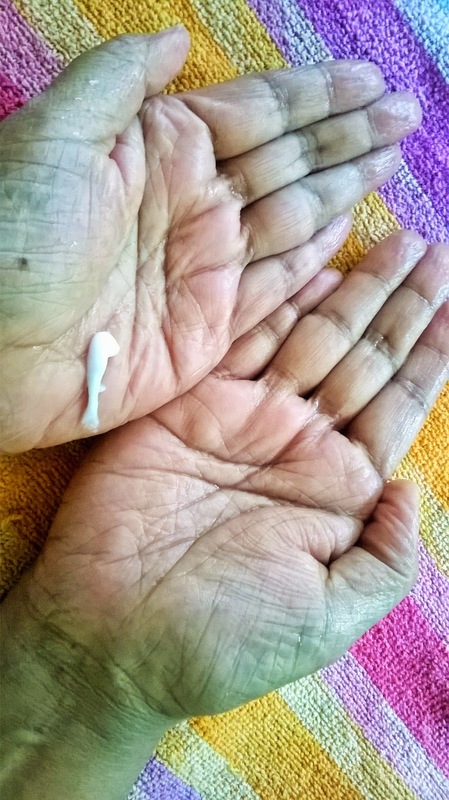 Application: My mother has crossed her 50s so, naturally she has mature skin and her hands had become quite dry. 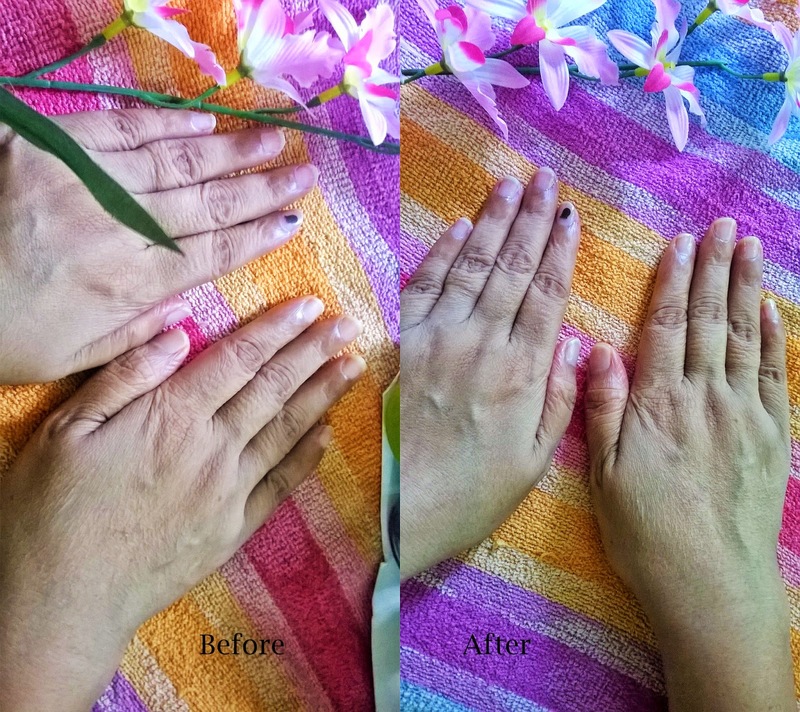 She desperately needed a pampering session, so I chose her hands to test the product and observe how the Oriflame Nature Secrets Lavender & Fig Relaxing Manicure Set fares on dry and mature skin. 1. 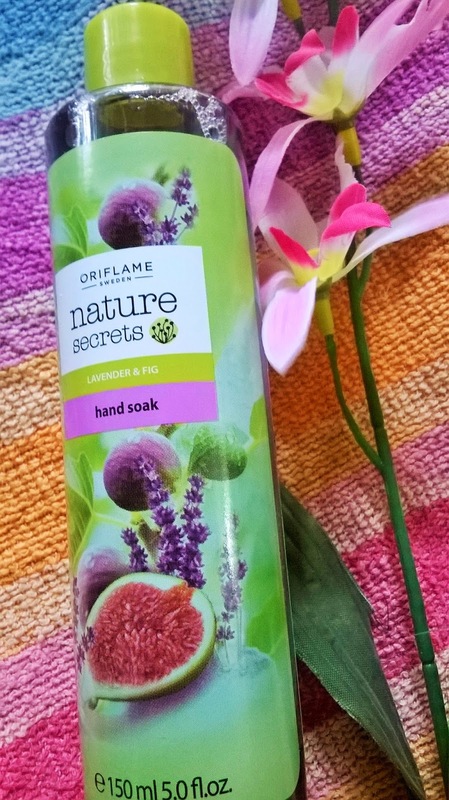 Oriflame Nature Secrets Lavender & Fig Hand Soak- This purple coloured transparent liquid has a lovely lavender fragrance. As instructed I used 2 caps full of the product in a vessel full of warm water. It did not create any foam. My mother soaked her hands for almost 10 minutes and once rinsed her hands have become very soft. 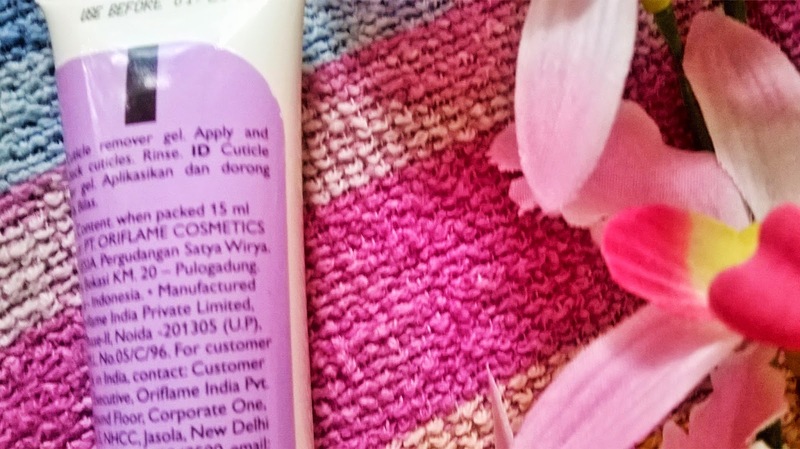 Generally if you use soap for a long time it will become somewhat dry, but my mother's skin did not feel dry and instead she was loving the soft feel and obviously the fragrance. 2. 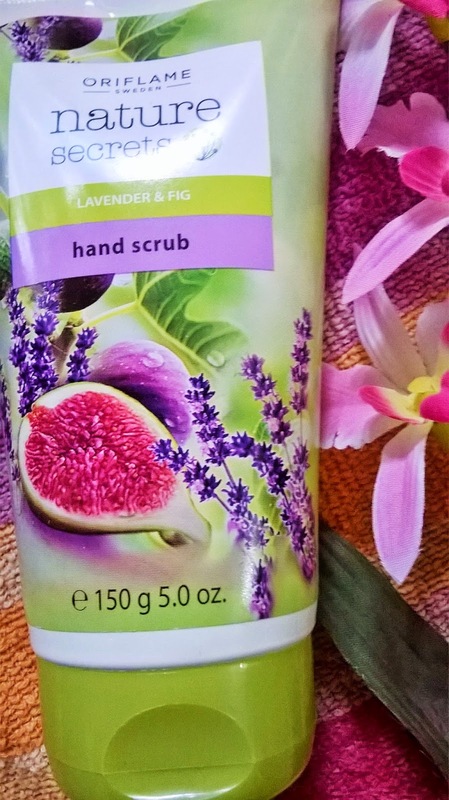 Oriflame Nature Secrets Lavender & Fig Scrub- It is a white coloured creamy scrub with very fine granules. As instructed I took a little more than a pea sized amount and applied on her hand. I massaged it for 2 minutes and rinsed off. I could see the difference it made to her complexion. The skin colour looked much cleaner and brighter and she said her hands was feeling very soft and smooth. I could make out how nice it has exfoliated her dead skin cells. 3. 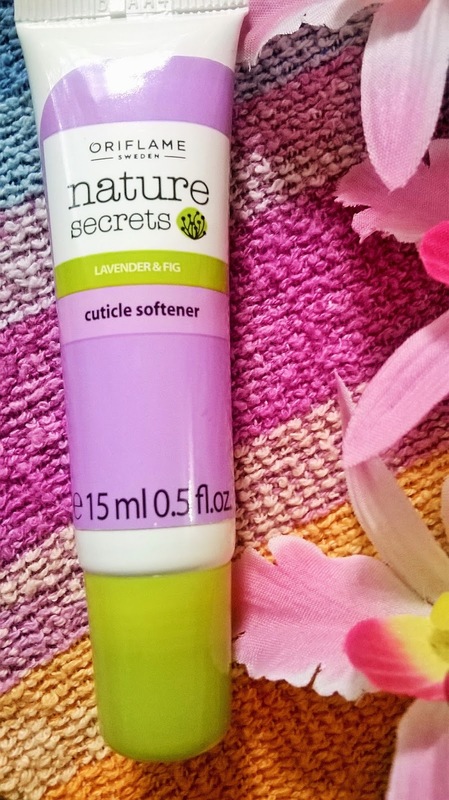 Oriflame Nature Secrets Lavender & Fig Cuticle Softener- This lovely transparent light green gel is quite runny but still the amount can be controlled by the applicator pen. I applied it to my mother's nail cuticles and massaged softly. Then I left it for almost 3 minutes and started pushing back the cuticles with the slanted applicator. This was a bit difficult and I thought the use of a proper cuticle pusher would have been easier. However, I gently did it for sometime the cuticles were well moisturized. 4. 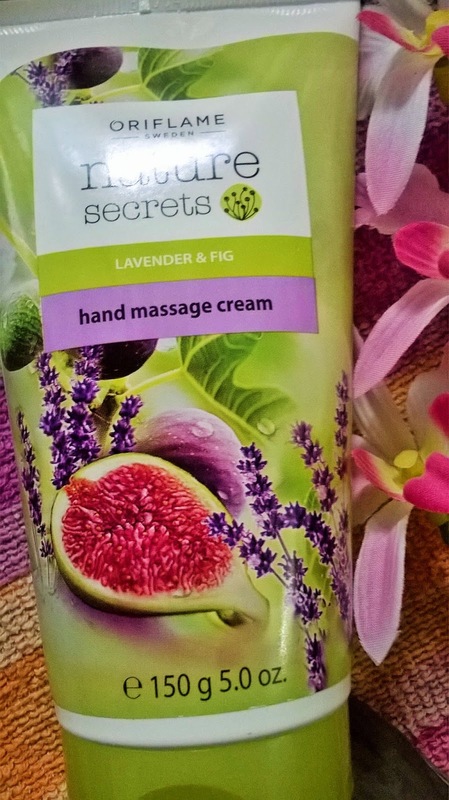 Oriflame Nature Secrets Lavender & Fig Hand Massage Cream- The last product to be used is this white coloured cream that has the texture of a thick lotion. 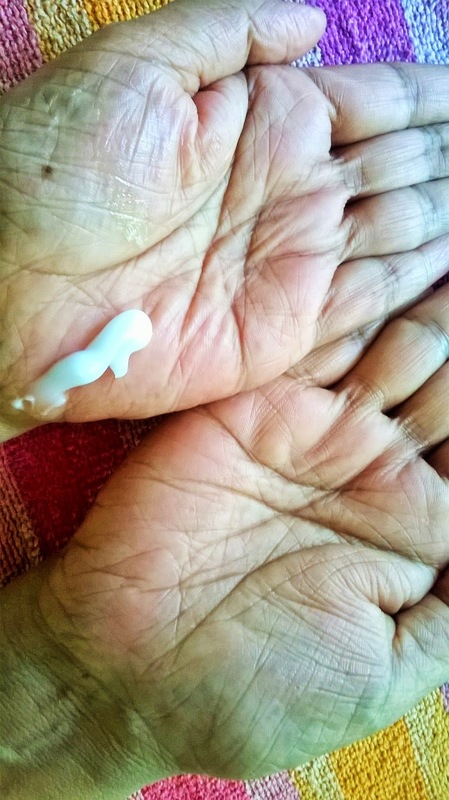 I first took a small quantity of the cream and started massaging my mother's hands, but then realized since she has dry and mature skin the amount of cream required would be more. So, again I took some small amount and massaged her hands for 5 minutes. She could feel that her hands were left super-conditioned and highly nourished. Experience: The first thing that is great about Oriflame Nature Secrets Lavender & Fig Relaxing Manicure Set is its lavender fragrance. 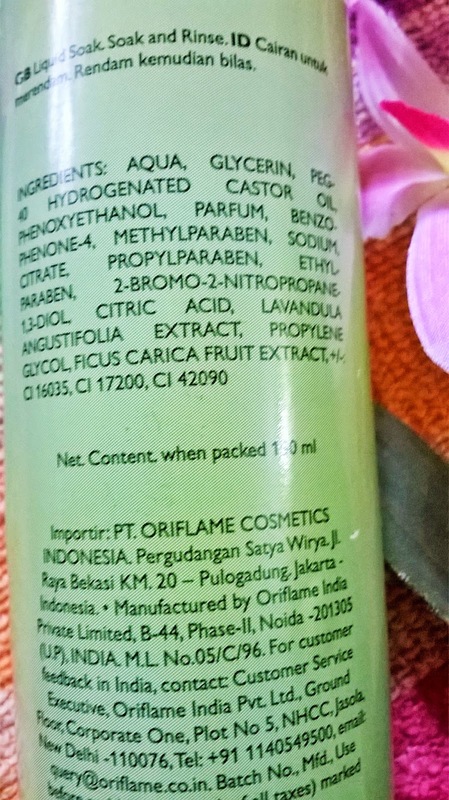 The packaging also is very attractive and it gives a feel of freshness. 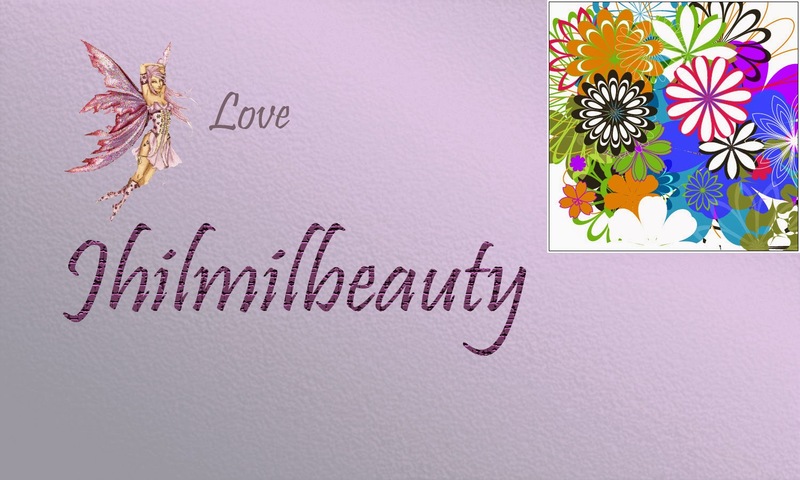 The products individually are very good, specially the scrub with its mico-granules is not at all harsh to the skin. 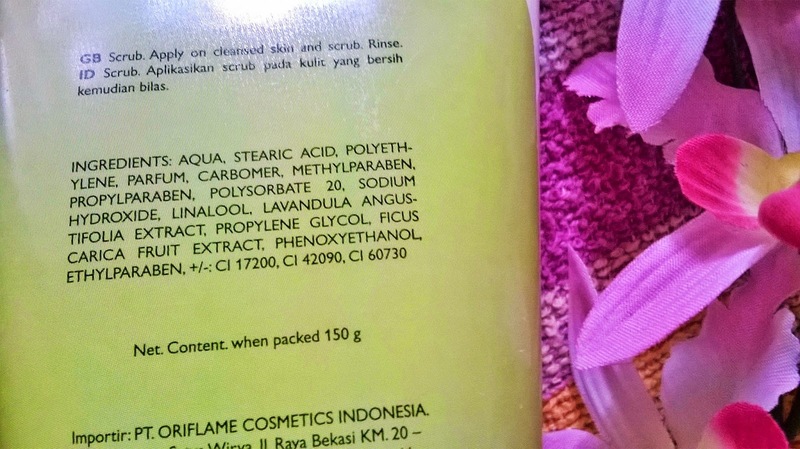 Girls who are fond of foamy soaks, may be a bit disappointed with the Hand soak, although it cleanses the skin quite decently. The turn down of the set is the Cuticle softener, in respect to its applicator.You need to use a separate cuticle pusher for better results. Overall the manicure set is a very good option for people like me who are lazy to visit the salon for manis. 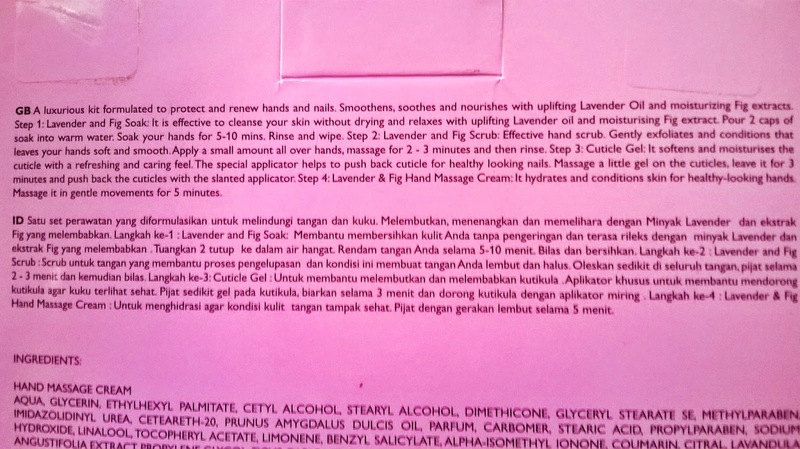 My mother was really overwhelmed by the results and admitted that her hands have not felt so soft and nourished for years. 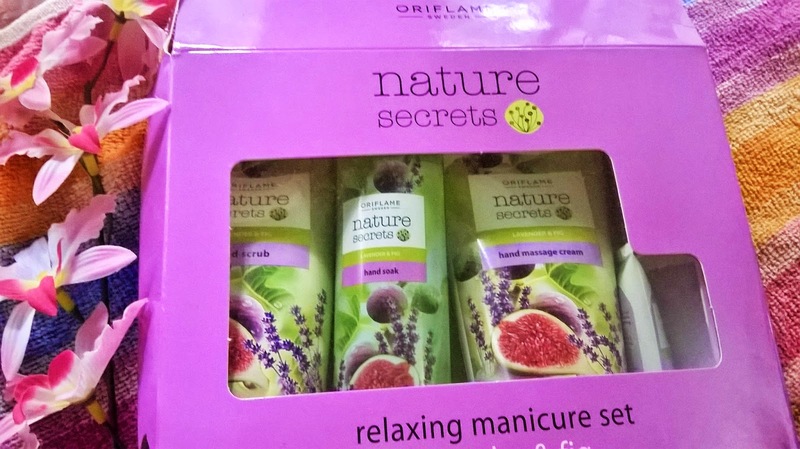 Overall Oriflame Nature Secrets Lavender & Fig Relaxing Manicure Set is a very easy to use product that can give instant results and is therefore a definite recommendation for me to girls who want to get softer and well nourished hands in just 20 minutes. It will also equally treat very dry and mature skin as shown on here.